This is theatre about theatre about theatre. Or, to be more precise, it might be theatre about criticism about theatre. Which makes this, I suppose, criticism about theatre about criticism about theatre. Wild Bore at the Soho Theatre is very meta-critical is what I’m trying to get at. Created and performed by Zoe Coombs Marr, Ursula Martinez and Adrienne Truscott (and **SPOILER ALERT** Krishna Istha, who – for meta-theatrical political purposes – doesn’t make it into the programme), the show re-contextualises the metaphorical pretention that is the language of the theatre critic, from reviews of the performers’ own shows, to examine the relationship between the critic and the artist. Playing with messy props, talking arses and curtain-within-table-above-table-for-another-table, the show is absurdly visual, poignantly comical and built upon the aesthetic formula of a genius dramaturgical design. At the essence, the show can be divided into moments of “verbatim” text, taken directly from the critics’ reviews, and then moments where the crux of the metaphors within these reviews are brought to life in front of us. The idea of the critics talking out of their arses, for instance, becomes quite literal as a few minutes into the show we’re confronted with three arses, resting against a trestle table, doing what can only be described as arse-lip-syncing. The arses are the critics. One holds a pencil, another has a cough and is offered a bottle of water by the stage manager. The notion of an audience focussing on three talking arse-holes becomes bemusedly ordinary. It settles into the norm. We forget the biology of the matter and, for some moments, watch the puppetry of the arse holes unfold in front of us. The meta-nature of the show is apparent from the onset (as a Stage Manager comes on and apologises for the delay, we hint that this may all be apart of the fun) and the purposeful failure is far from hidden; as they talk about poor sound design, the microphone volume drops; as they speak of people walking out of the show, lo and behold, a group from the front row leave. All the “bad” elements of this show are strategically part of the design; moments that seem as if for ‘no apparent reason’, a line the performers return to, are systemically built into the structure. This in itself is a comment on the critic-artist relationship; that being the critics’ tendency to criticise a moment as irrelevant or unnecessary without giving it a proper analysis or thought; the role of the critic is practically irrelevant, for they do not venture into the realms of contemporary analysis, but rather compare the shows they see with what in truth already exists; a critic can only criticise a show by saying what it is not; the experiments of contemporary performance seem totally wasted on the eye of the critic. Whether accidental or meticulously planned, images of an arse eating up a face by closing in on itself (the face being at the hole of the arse) or of another arse trying to light up a cigarette, simply crack us up. There is something fundamentally comical about toilet humour which makes the view of an arse vomiting diarrhoea and then eating it back up again totally hilarious, in a frozen-laughter sort of way. The show is unapologetically symbolic. It uses the critics’ word against the critic; if Al Pacino walks like an anchovy, then this lot want to see the walking anchovy. 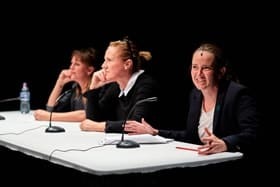 In achieving its political stance, it has to make some bold choices; particularly with the decision to make a point about the lack of representation of an intersectional feminist body on the stage by doing the very thing it criticises and tokenising such a body. Ultimately though, the work is only reflective of the criticism of other work, so this mirroring keeps consistent with the overall “narrative”, should one exist. This work seems futile to criticise from the perspective of the meta-critical, but removing the content from the context, Wild Bore is a powerfully contemporary, aesthetically imaginative and ludicrously intra-contradictory expression and examination of the ways in which we criticise performance. Danielle Brustman’s set design brings delight after delight, and in making a show that by very nature aims to justify the unnecessary, it seems impossible to critique without falling to the side of the enemy. But hopefully I have done my best. Ah, the critics – intimidating, pompous, rude and malicious and yet, often cultured, bookish and wise. If they love you they’re wonderful…but if they don’t, they’re just downright villainous. Soho Theatre and Australia’s Malthouse Theatre bring together three masters of smart, spiky, political performance in an international supergroup of Zoe Coombs Marr (AUS), Ursula Martinez (UK) and Adrienne Truscott (US) in a London premiere after its European debut as part of Soho Theatre’s 19-show Edinburgh Fringe season of new theatre, comedy and cabaret. Wickedly self-deprecating of their own avant-garde artistic practice, and ready to throw some punches, the three have teamed up for the first time to delve into the torrent of critical fury that each have attracted throughout their careers, to prove they too are not afraid to talk out of their arses. Reviewed extensively, garnering almost every star rating in the galaxy during the festival, any resemblance to critics, living or dead, is purely intentional.